Wandering Polka Dot: Tasty and Wild - Benvenuti a Napoli! Tasty and Wild - Benvenuti a Napoli! Finally I am settled down in one place and have time to start re-living my big Italian adventure here on the blog. For those of you who missed it (how could you?! ), I was travelling through Italy in September for almost three weeks. September is the time off in my master's program—except for the conference Science of Aphasia that we are supposed to attend. The conference is held in a different place every year, so this time it was Venice we had to go to. We've known about this for a year and I was very excited, because I had never been to Italy - even though it is rather close to Serbia. But it never bothered me too much because I've always known I'd go to Italy someday—who would miss this gem of a country anyway? So as the summer approached, I decided not to go to Serbia in September - that's why I went home in July, I wrote about that on the blog—but to Italy. From Rome up north! But then a dear Italian friend of mine told me to go to Naples. Naples? Ummm, I've heard of it, of course, but why should I? "They have the best pizza there," he explained. "Naples is the home of pizza. You will not have better pizza anywhere else. And you should trust me on this, because I am from the north, Naples is in the south, and we're not each other's favorite people... so when I tell you pizza is the best there, you know I'm not lying." Well. Pizza indeed has been my favorite dish since I was a little child. Didn't take much until I booked my ticket to Naples. That morning I boarded on a plane to Rome (it was 26 days ago but feels like it's been ages!) I was beyond excited. Not only this was my first trip to Italy, but also my first solo trip ever. I didn't even have everything sorted out, like where I would stay in every city, tickets to every city... but I did feel a great anticipation for whatever awaits me once the plane lands, and I was just plain happy. And as for Naples... well, my first impression was such that I sent a text to mentioned Italian friend asking if there is a need for English teachers here, because I wanted to stay!! The city is so picturesque. I walked with a map from the central station to the center, but then I took a turn just because I saw some interesting buildings. 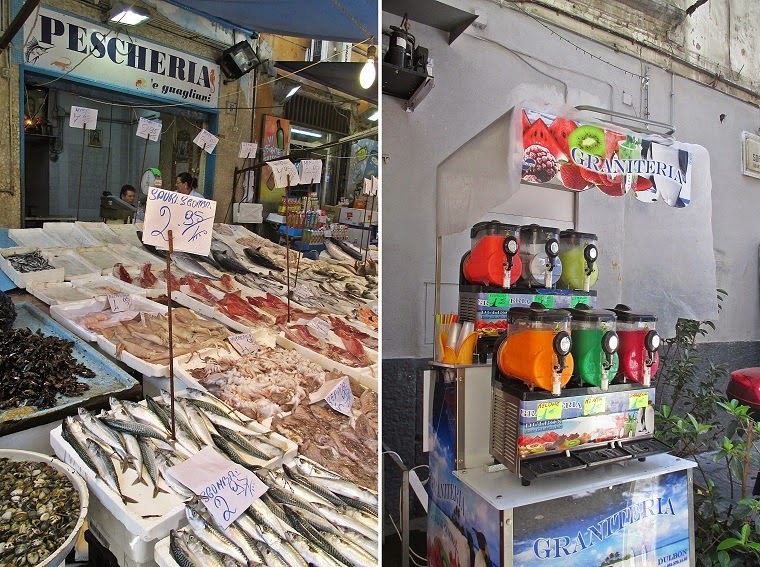 I was so glad I did, because the street took me to an amazing fish market. I love markets. This one was especially loud and lively - that's how the people in the south of Italy are. :) Also, because I was a solo female traveller, I could hear 'ciao, bella' too many times. Some Italians were even approaching me and introducing themselves. I wonder if they really get anything with that approach, from anyone. Maybe not, maybe they do it just for fun. But seriously, I felt as if they are obliged to yell 'ciao, bella' to every girl around. Architecture-wise, Naples is just too cute. I had never seen streets so narrow in my life—apparently they are an Italian feature, not Neapolitan. For the majority of the streets I was completely sure that they were pedestrian areas - but then a vespa would show up and prove me wrong, and shortly after a car. It's just unbelievable, but it's obviously working! Another thing I fell in love with is clothes on the wires and balconies. I don't know if Italian people have any idea how charming it is! 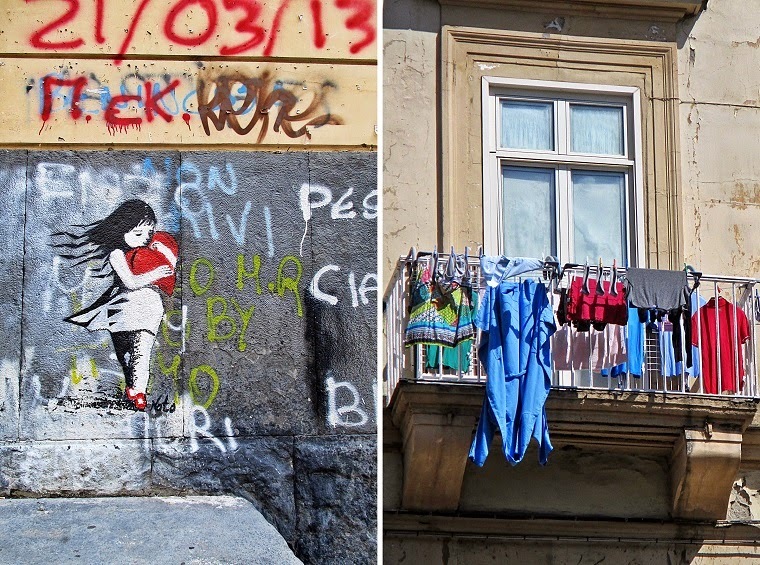 At first it was also a big surprise for me because in Serbia it is prohibited to hang your clothes to dry on a balcony if it faces the street, but apparently that's not the case in Italy! And after initial surprise, I just couldn't take my eyes (and camera) off these little pieces of art. What To See And Do In And Around Naples? 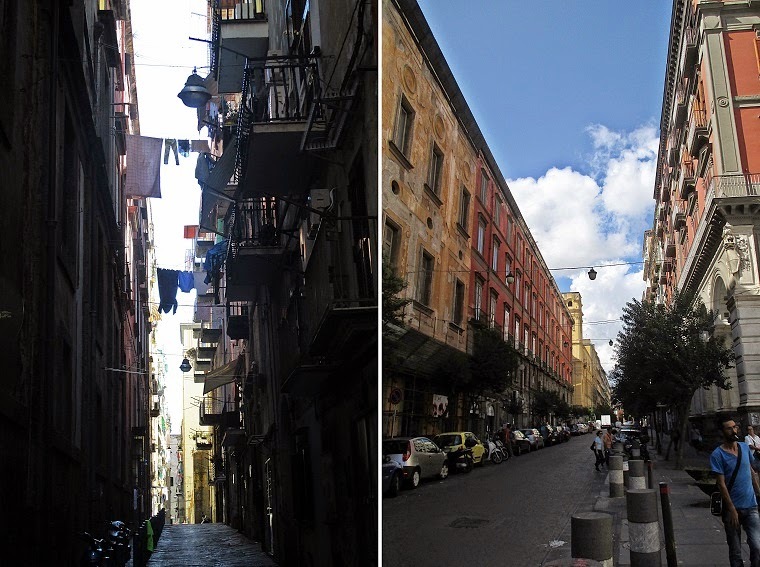 Wandering through Naples, I felt a sting of embarrassment I had only devoted an afternoon to this city. Honestly, I didn't even have a clear plan mapped out with my usual what-to-do's. My only Naples plan revolved around pizza (at this point my Mom would probably roll her eyes, haha!). Well, I'm not unhappy it did, Neapolitan pizza is the mother of all pizzas (read about that below! ), but it felt that the city is so much more. I am sure I will be back at some point—Naples is the city you want to keep coming back to—at least I do. So next time I will definitely follow this guide, though I have seen some of the things in it. Feel free to copy it and be more prepared than I was! Football is a very Italian thing - that I know in theory. So it was so much fun seeing kids playing football everywhere. Oh, and then we get to basically the initial reason I went to Naples - pizza! Let me be frank with you. I'm a traveler, and I don't need too much persuasion to decide to go places. But when Gabriele told me that I am to expect the best pizza in the world in Naples, I wasn't really convinced. I mean, yes, I love pizza, but pizza is just a good meal and no matter what you do with it, it will still be good, right? Well, no. I was wrong. I was VERY wrong. I went to a restaurant called Sorbillo, Via dei Tribunali 32. It was recommended to me on Couch Surfing by an American who has been living in Naples for ten years. He said it was the best - well, who am I to question the local? (Or a semi-local.) So there I went. Guys. You cannot imagine this. I certainly couldn't have. After the first bite, I died and went straight to heaven. IT WAS THAT GOOD!!! We all know the hashtag 'foodgasm' on Instagram. But this was literally a foodgasm in my mouth! I kept eating and thinking (thinking, because I was alone, otherwise I wouldn't have restrained myself from yelling) 'mamma mia, mamma mia!!!'. When I was done, I thought to myself that I must not ever eat pizza anywhere else in the world. It would be a blasphemy. What they call pizza elsewhere, mamma mia! Of course, I did eat it eventually. But every time I would end up comparing it to the Neapolitan one. Everything else is crap after the Neapolitan pizza, trust me. So you might not even want to try this godly pizza... it may ruin all your future pizza experiences. But then again... try it if you get the chance. It's just indescribable. Oh, how I crave a slice right now, thousands of kilometers away. And then it was time for dessert. My friend Gabriele texted me names of like 5 different pastries I should try when in Naples - but I didn't have time for that, nor the space in my belly. So I opted for the ones he said were the most important - sfogliatelle. He even told me where to go to get the best ones - at Attanasio, Vico Ferrovia, close to the central railway station. I went there and faced the huge queue. At that point I didn't even know what I was waiting for, so I ordered one sfogliatella and had to wait for it for 15-20 minutes. When I finally got it, I was a bit disappointed: it's just a plain little piece of pastry with what seemed like cheese inside. But then... Naples got me again. First bite, it's how much it takes. I am not exaggerating when I say it tasted better than any other sweet in my life!!! The pastry was crunchy, the sweet cheese melted in my mouth - I was like, what do they put inside, pure love?! Apparently, it's ricotta cheese and cinnamon. So simple and so perfect. It was even better. Stay tuned for the rest! P.S. Also in the region: Positano, and Pompeii. Kako je ovo divno, čista ljubav <3! Hoću i ja sad u Italiju, naročito u Napulj! Trebaju te zaposliti u kancelariji za turističku promociju Italije :D (ok, možda i svake države koju posjetiš ;)). Happy Friday - Weekend Reads!